Simulators enable drivers to react to danger without any risk, but they'll never replace on-road tuition, reports Matt de Prez. Imagine you could control the weather, traffic and behaviour of other road users. You could see how well your drivers can control a car in the snow – in August! Watch how quickly they react to a child walking out in the road, without threatening anyone’s life. Or, show them how dangerous using a mobile phone at the wheel can really be, again without any real risk. An advanced driving simulator can achieve all these tasks, and more, in one morning at your office. Driving simulators aren’t new. XPI Simulations, one of the country’s leading simulator specialists, has been developing them for more than 10 years for a number of clients, including the military, police and universities. But now the company has launched its own driver training centre and is opening the doors to fleets with a range of bespoke training packages and driver assessment services. Steve Dethick is manager of XPI’s Driving Simulation Centre. He has vast experience in on-road driver training and has made a career from improving the skills of drivers from all parts of the spectrum. “You’ll never replace on-road driver training,” he says. “I think simulators can complement it and do more targeted training. “The main difference is that on a simulator you can get to a situation much quicker. With two clicks of a mouse it can be snowing or dark. On an on-road training day you have to try to find the situation and there is quite often a lot of wasted time. He adds that one of the key elements of simulation training is to safely demonstrate the effects of distracted or tired driving. Drivers get first-hand experience of what happens when you repeatedly take your eyes off the road. A simulator allows the instructor to play back the virtual drive to the driver and compare it to one where they were fully focused. “It’s impossible to safely demonstrate this on the road,” explains Dethick. The centre, in Chessington, has two static simulators and eight mobile units which can be transported to other sites. The centre can accommodate up to 40 drivers per day, with a mixture of simulation training and classroom-based sessions. 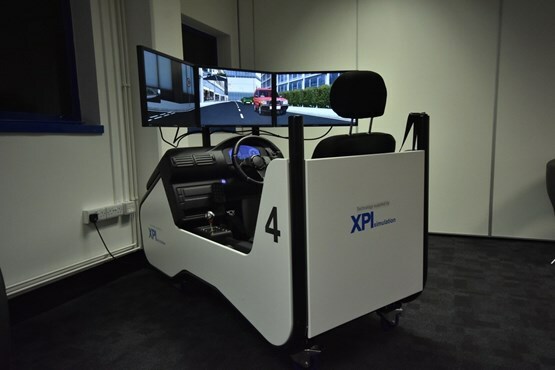 Single-seat simulators, known as semi-immersive, are portable and can be used at XPI’s training centre or at almost any location. They can be used independently or linked together, a feature the police use to practice synchronised manoeuvres. The driver sits in a proper, adjustable car seat, complete with a seatbelt. There are three pedals and a steering wheel with indicator stalk, gearstick and a digital dial cluster. Three monitors provide a panoramic view of the virtual road ahead. “The simulators don’t have to be fully-immersive,” says Dethick. XPI can look at steering technique, gear use and smoothness of controls as part of the assessment, but Dethick says that’s not the main focus. The centre is also home to two full-size simulators which are based on road cars that have been converted. A 270-degree screen gives the driver a realistic view out of the front and side windows and a rear mounted monitor and screens in the mirrors give an almost 360-degree view. A van simulator is also in development and the company wants a truck one too, so it can offer packages for car, van and truck operators. However, Dethick explains that the car simulators can do an effective job for any type of driver. “We are looking for how drivers respond to the hazards they see,” he says. XPI’s trainers fill in a report on every driver that completes the training. Any driver who demonstrates behaviour that highlights unsafe driving will be reported to their fleet manager the same day. “Our reports are graded as low, medium or high risk,” says Dethick. “As we don’t go on road we can only advise how those traits could be interpreted on the road. The engagement we’ve had so far has been fairly accurate. “Currently we don’t offer on-road training but it’s something I’m pushing for. If we grade someone as high risk we can then do more to rectify the issue. “But we are a simulation centre and our focus is very much on the simulators to start off with,” says Dethick. One day hire of a simulator costs around £1,000 and can train eight drivers. Dethick says this compares to an average of £400 for one day of on-road tuition which will cover only two or three drivers. Dethick’s long-term plan is to build a mobile simulator van which can be taken to customer sites and deliver the training in a self-contained environment. During our visit to the Driving Simulation Centre we put the range of simulators through their paces to see how they shape up against the real-world driving experience. The first thing I noticed was how crisp the graphics were. The street furniture, pedestrians and other vehicles on the road are realistic. Centre manager Steve Dethick told me the system is about to undergo an update to further enhance the visual clarity and add further realism with more activity on screen. After a quick practice run to acclimatise to the controls, Dethick started the first exercise. It was based around hazard awareness and requires the driver to honk the horn or flash the lights when they see a potential hazard. It immediately highlighted the importance of looking ahead, as concentrating on the vehicle in front meant I failed to spot a child approaching a zebra crossing. A last-minute emergency braking manoeuvre was required. I fared better on the second attempt and, at the end, the system showed me how fast I’d reacted to potential hazards and where I could improve. Further modules allowed me to try driving while answering text messages, while tired and in the snow. The realism of the car’s controls, sounds and haptic feedback was impressive, as was the behaviour of the virtual traffic. We then switched to the full-size car. All the controls are connected to the simulator – even the radio and air conditioning still works, and it starts with the key. This time I could look left and right at junctions, or over my shoulder to see oncoming traffic. The car pitches, dives and leans as you drive and even replicates the shunt of hitting a kerb. The simulator experience proved how so many day-to-day driving habits can be spotted and improved in a short space of time, without the need to venture on to the road.